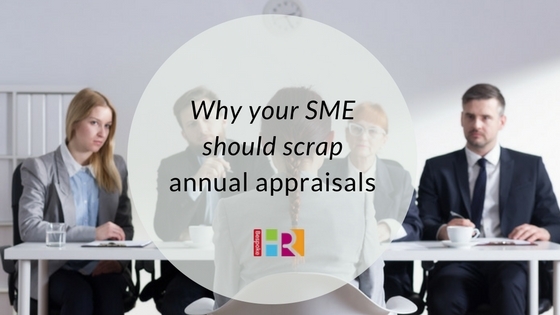 Over the past few years, we have read about many large employers scrapping the traditional annual review format citing it as outdated and irrelevant. These organisations have discovered that continuous performance reviews are a better fit with the growing number of millennial employees – a demographic no business can afford to ignore. According to PWC, millennials will make up an estimated 50% of the global workforce by 2020. So why is this generation prompting a change in process? To quote Accenture CEO, Pierre Nanterme, “the old ways of employee engagement simply don’t cut it.” Millennials expect access to real-time data with information on demand, and this needs to be replicated in the workplace. But if the staff / manager relationship is changing, how can small businesses keep up with larger employers to attract and retain the best talent? Staff want regular feedback. Meeting annually to review performance is not only often demoralising, but can be de-motivating. Highlighting areas of improvement in one bulk session with an employee is never going to be a positive experience. At this stage, it’s also often too late to tackle any serious performance problems or issues causing the disengagement of the employee. Regular feedback allows staff to review their output throughout the year. It also helps them to make changes, flag up if they are struggling, or request a change of direction. Line management is evolving. Depending on the size of the business, your team may work with more than one manager who will influence their development. Relying on one manager’s perspective during an annual review could lead to issues of bias. Gathering feedback from a range of people such as team members and other managers may provide a more realistic and objective picture of an employee’s performance and make any personality conflicts less of an issue. Changing job roles. Roles and responsibilities can often change and develop as your company grows. Continuous dialogue between staff and managers will allow your team to know what’s expected of them, and deliver. Choose a feedback format. Think about how you will you monitor, record and track dialogue. You could consider using performance review software which will help track performance objectives, outcomes and allow for peer 360 degree feedback. Understand the difference between performance management and performance review. The first is your system to monitor and assist staff who may be under-performing and need to follow a specific track. A performance review is an opportunity for you to reflect on recent performance, discuss future goals, pay and promotion. Always keep these two separate. Encourage self-evaluation. Ask your team to think about their own performance on a continual basis and discuss this with them. This will make it easier for you to manage potentially difficult conversations and structure their job roles appropriately. Set goals in partnership. Agree and set goals with in conjunction with your team members which are achievable and motivational. Your staff are likely to feel more empowered if they know they contributed to their development plans. Don’t be rigid with goals, reflect and refine regularly so that they are achievable. Consider personality profiling to understand your team. Remember that no-one wants to under-perform. Personality tests (such as MBTI® / Myers Briggs Type Indicator® ) can help you to understand why an employee may be struggling with your managerial style, specific tasks, or other members of the team for example. This can help you to make changes necessary to support the employee, rather than replace them. Be clear on your company ethos. Make sure your team know what’s expected of them, how they can achieve this and what they will receive in return. Create a company handbook with clear guidance, and replicate this in their development plans. Document all discussions. Create a system to document all conversations, using HR software for example. This will help you to chart development, refer to previous discussions, and protect yourself legally in case of future issues. Beware of micro-management. Whilst continuous appraisal is positive, make sure you take a step back and allow your staff to use their initiative too. You don’t want staff to feel they are being constantly watched or criticised. Ease into it. Make the changes to your processes slowly so that staff don’t feel overwhelmed or under pressure. Explain how the system will work. Tell your team why you are changing the system, help them to understand why the new way of working will benefit them. Get in touch if you would like help with your staff appraisals.